I’m a glove addict: I admit it. It used to be part of my seasonal ritual to visit the local tack shop and peruse their latest collection of gloves. Over the years I’ve tried just about everything — Miller’s Good Hands, SSG, Neumann’s, traditional string, and Roeckl to name a few. When I was riding between seven and ten horses a day, I’d go through a pair of gloves every two to three months, so usually bought the classic SSG pigskin with knit back, or their full leather doe skin. 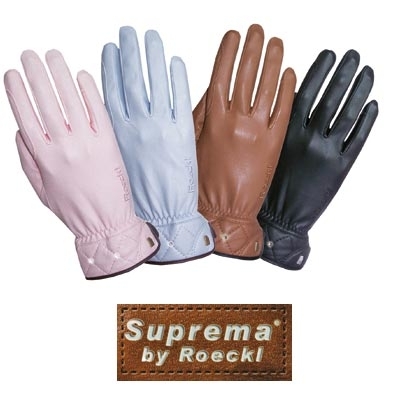 When I recently trimmed down to one horse, I decided to make a “luxury” (or vanity, actually) purchase of cotton-candy pink Roeckl Suprema gloves with Swarovski accents. The gloves were (note the past tense) absolutely beautiful, and totally unlike my more workmanlike choices of years past. I particularly like the quilt detailing around the wrist and feel the crystal accents are subtly elegant. The material is quite thin, giving good tack and feel. However, my love affair stops there. After about three months of riding, the gloves’ pink color has peeled off the knuckles and other flex areas, and holes have started to wear through the rein fingers and across the palm. Maybe I’m expecting too much from a pair of gloves, but I really do think that for approximately $60.00, the Supremas should’ve lasted more than 12 weeks. After all, my Roeckl Chelseas are still going strong after — wait for it — ten years. That’s right . . . ten years of daily rides on lots and lots of horses. I know the Chelsea features a microsuede palm, and perhaps the fabric makes all the difference. But, seriously, the Suprema material isn’t that supreme. Ultimately it’s a very pretty vanity glove suitable for light or sporadic use. In my experience they don’t hold up to regular, daily wear. Save them for clinics or special occasions. Next Post In Defense of the Dutch: Or, What’s Jumping Got to Do With It?